The Adventure Tour is 1.5 to 2 hours of riding, ideal for riders of any skill level. See the descriptions of various skills levels. The Epic Tour is 2.5 to 3 hours of riding, ideal for riders of any skill level. See the descriptions of various skills levels. We offer private lessons for all skill levels – Beginner, Intermediate and Advanced. Book now to up your MTB skills! Want to try Mountain Biking? Have you always wanted to try mountain biking, but don’t have a bike or know where to go? Try our 'Introductory Tour' option and we’ll take care of everything. For $100, we’ll provide a fun and safe tour for your first adventure. Your bike and all the gear you’ll need is included. Want something else in mind? Tours can be designed and catered to any number of riders and for any skill levels. L.A. Mountain Bike Tours is owned and operated by Scott Petryshyn. Offering rides for the beginner to the hard-core enthusiast. Scott guides riders along many of Southern California’s most beautiful and majestic riding trails. Exploring amazing terrain, beautiful vistas, valleys and breath taking views of the ocean and coastline. Your adventure will include everything from scenic leisurely trails to the aggressive and heart-pounding. L.A. Mountain Bike Tours has something for everyone. Riders can bring their own bikes, or we can provide you with the latest in high performance bicycles. We also offer mountain bike lessons for all levels. Call now, rides book up quickly. Start your adventure today! Scott Petryshyn started his adventure career as young teen racing motocross for Team Kawasaki. After gaining his bachelor’s of science degree in Biology and Kinetics, Scott moved to LA and quickly became a notable Personal Trainer, specializing in nutrition, strength and overall endurance. His love of motocross evolved into a career in mountain bike racing where he became competitive on the semi-pro circuit with multiple wins and state championship titles. He attracted sponsorship and support from many top companies like, Intense, Giro, Oakley, Sixsixone, Fox, Kenda, Camelback, Optic Nerve and Abus. As well, Scott was a featured stunt rider in many national TV campaigns for Dockers, Subaru and Nissan and he became a regular contributor to various fitness and sports magazines. Scott has written monthly workout articles for Shape magazine and was a mountain bike test rider for Mountain Bike Action magazine for over 10 years. I have just got back from a fantastic 3 hr ride with Scott in the mountains. Challenging but hugely enjoyable and exactly the right level for my ability. Arranged at less than 24 hrs notice, Scott picked me up and delivered me back to my hotel and provided all equipment. If you are in LA and want a mountain bike adventure, look no further. Scott, I want to thank you for the awesome ride with the challenging climb and exciting downhill. The scenery and the trails were great, thanks again for the tips. I will be back again! Thanks so much for the mountain bile ride over the weekend. It was excellent to see a part of LA that i certainly wouldn’t have been able to. The location you chose was perfect for my skill set – Enough to test me but enough for me to enjoy it the ride! Next time I’m in town I’ll be sure to book another ride! Starting to notice some droopy shoulders around the office? Does your team need a bit more pep in their step? Sounds like it’s time to plan a team outing. 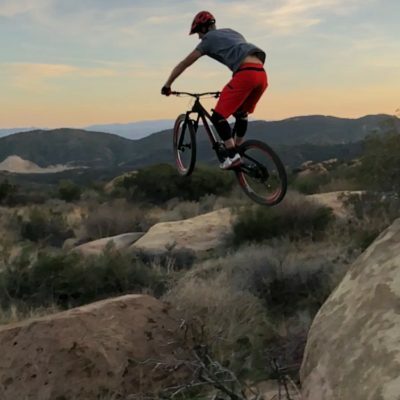 LA Mountain Bike Tours will search high and low for the best rides that can inject that much needed excitement and fun into your working lives. These types of events immediately break down barriers and spark communication between everyone taking part, and this shared experience will pay dividends long into the future. They’ll give the team that much needed morale boost that will refresh they way they work for many weeks to come and create new friendships and bonds within the team.